AMCIS, a preeminent information systems research conference, conducted under the auspices of the Association for Information Systems (AIS), attracts 1000 or more attendees from North America, as well as other regions of the world. The conference program includes research paper presentations, panel discussions, keynotes, doctoral student consortium, and a camp for early-stage IS faculty. This year’s theme, A Tradition of Innovation, reflects the program chairs’ desire to highlight IS studies that build on previously-reported research and IS studies that take innovative new methodological or theoretical directions and address emerging technology challenges to strengthen or extend existing theories and propose new theories. Boston exemplifies A Tradition of Innovation. 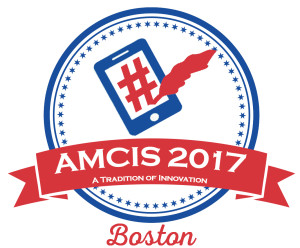 AMCIS participants can retrace the steps of the historic Freedom Trail and visit hubs of research-driven innovation at nearby universities, where they will feel the buzz of entrepreneurial energy that powers the Boston-area economy.